Summer is here and that means one thing (besides trying to find something to do with your kids!) – grill season. One of my favorite things to flip over the rails is veggies. I hate to use my oven in the summer as it only adds heat in the kitchen. Grilling is a healthy and easy, not to mention cooler, option. Some of my favorite veggies that work well on the grill are asparagus, eggplant, red, green, and yellow peppers, zucchini (yellow and green) and cauliflower. Or have you ever tried to grill romaine lettuce? It’s amazingly simple and a perfect twist to a plain old summer salad. While grilled veggies have more than enough flavor to stand on their own with just some olive oil, salt and pepper, and perhaps a squeeze of lemon, I have created an excellent accompaniment that takes full advantage of summer basil. My vegan version of traditional pesto will also add flavor to your favorite proteins like steak and chicken. 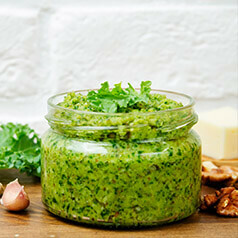 Chock full of healthy fats from the walnuts and olive oil, kale gives the pesto an extra nutrient boost. Add 1/4 cup of the olive oil, lemon, salt, garlic, basil, and kale to a high-speed blender or food processor. Blend until well mixed. Add walnuts and blend again as you drizzle remainder of olive oil in. If more liquid is necessary, you can add a little more lemon juice or water to help the mixture move and blend better. Feel free to add a little more salt to taste. Drizzle over grilled veggies, meat, chicken or fish or serve on side as a dip.